The last of the recipes picked out for August was the liqueur souffle. I meant to do those while it was August. That didn’t happen. I also meant to do them before I did any of the September recipes. Also didn’t happen. Oh well. They got done. Souffle is a thing with a reputation for being very difficult. This has not been my experience of souffles, and this time around did nothing to change that. The recipe even came with an ingredients list scaled down to four servings, and instructions for a la carte style prep in case you weren’t serving them all at once. How useful! So you’ll understand that I was worried about this recipe from the outset. 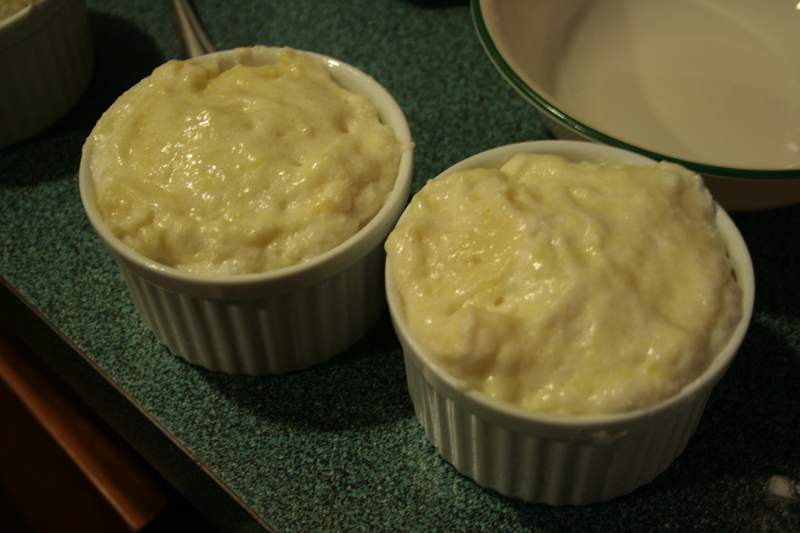 There were basically two phases to making the souffle: The early prep and the final assembly. 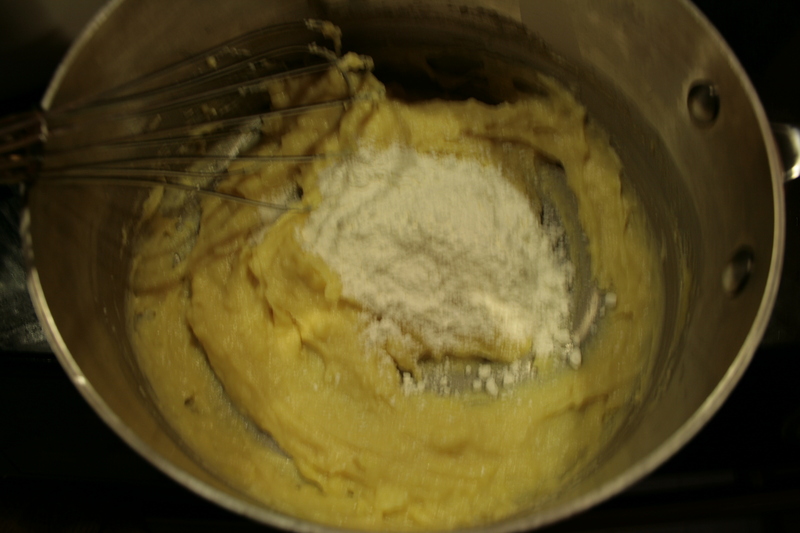 The early prep involved mushing butter and flour into a paste, mixing some sugar and corn starch, and then throwing all of these together with some scalded milk, egg yolk, vanilla and liqueur to form a custard. 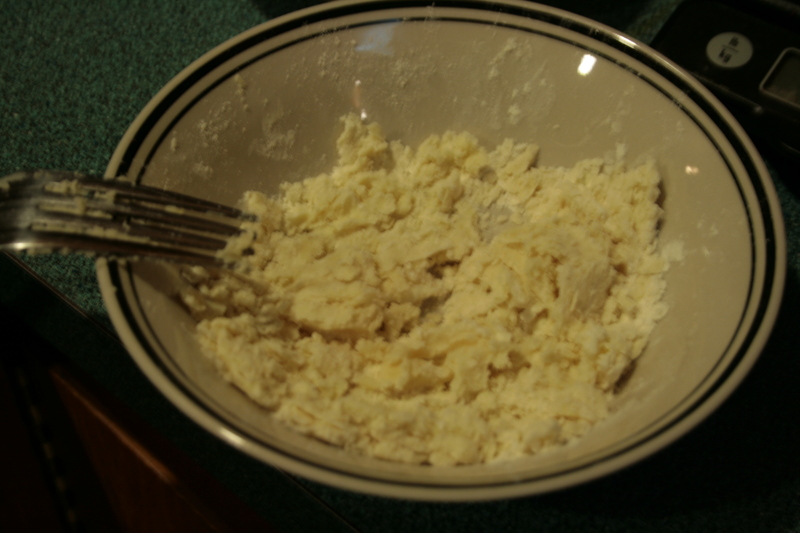 This is about how much I mix dry ingredients with butter when I’m making pie crust, which means this was dough more than anything I’d classify as “paste.” But it wasn’t going to get pastier without adding more flour. That’s what I got when the butter paste incorporated with the milk. Now it’s paste! I double-checked the recipe to make sure I hadn’t shorted the milk. Nope, 3/4 of a cup is what it called for, and that’s what I used. No biggie, says I. The next several things I add are all liquid. That’ll turn this back into something resembling what the recipe seems to expect. Or not. This is what I had when it was time to add the sugar and cornstarch mixture. The recipe refers to the final product here as, I kid you not, “custard.” Even if you don’t cook, if you’ve been reading this you’ve seen what a custard looks like. It’s liquid. This is not. Whatever. I have people expecting souffle. Time to move to the second stage of the process: Assembly. This was really straight-forward. 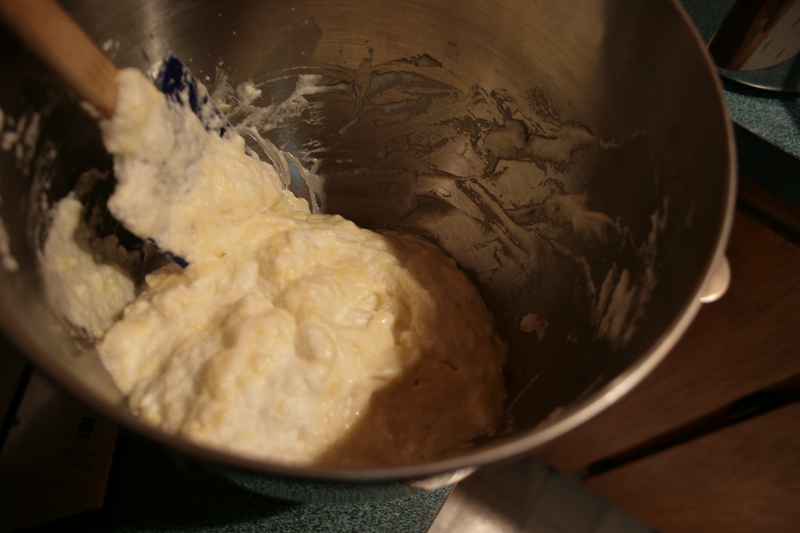 Whip eggs to soft peaks, add sugar, whip to stiff peaks. You’re going to be seeing a lot more of this because September’s chapter is meringue, and what you’re doing here is making meringue. Look at those glossy stiff peaks. 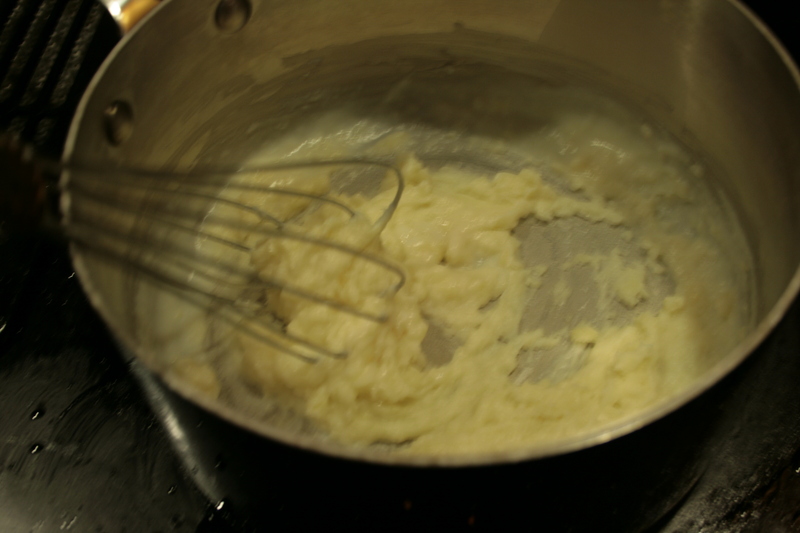 This took no time at all, unlike some other egg white whipping experiences I’ve discussed here. Yay for civilized autumn weather! And that brings us to the part where the gloop from the first stage has me worried. 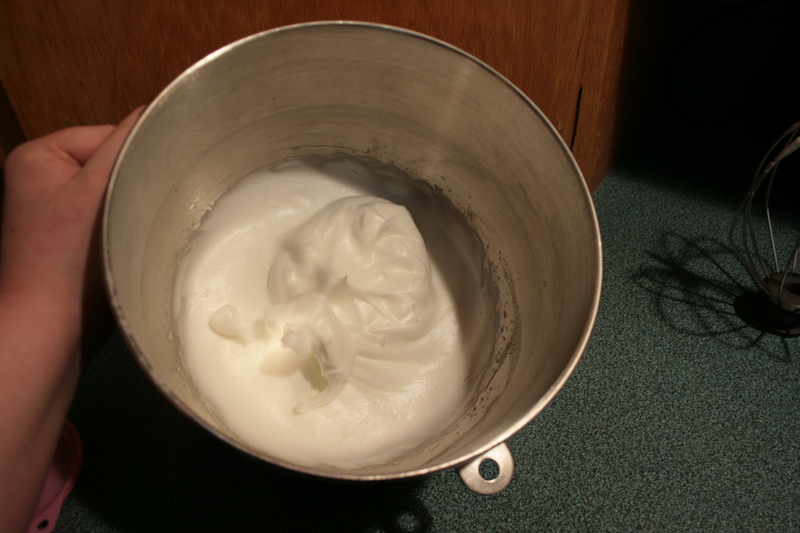 I need to fold the gloop into the egg whites such that I don’t have souffles that are basically baked meringue with strips of thing in them, but also without collapsing the whites. Spatula powers: Activate! From there it was just a matter of putting the batter into ramekins. Then baking and serving. The cookbook called for making a sabayon sauce, but given how every time it has me make a sauce I wind up with eighty bajillion times what I need, I was disinclined to do that. I used the Calvados as the liqueur and I had home made apple sauce. These bad boys got served that way. I sprinkled some nutmeg on, too, just to make it extra pretty. Despite the confusing gloop, these turned out pretty well. They were tasty, and the applesauce was a great pairing. These weren’t worth waxing rhapsodic over, but given how easy (and relatively fast) they were to make, I wouldn’t rule them out as a go-to if I were trying to impress somebody. 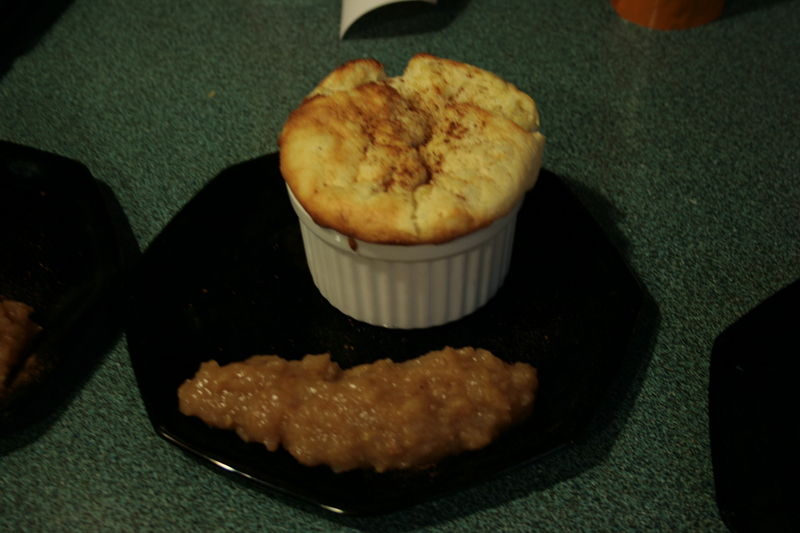 Then again, I’ve made souffles I was more impressed by, so I’d probably go back to one of those recipes first. Next time: Blackberry tartlets with Lemon Curd.